The fun new way to score flatter, firmer abs? Kettlebell Kickboxing, a fierce, total-body strength and cardio workout that fuses core-toning kettlebell moves with fat-fighting martial arts. Created by certified kettlebell instructor Dasha Libin, MS, NASM-PES, the powerhouse fitness method tones your entire body while torching calories and improving your flexibility. Her workouts include traditional kettlebell moves, kickboxing cardio bursts, and martial arts motions that integrate the bell. “These exercises build beautiful, strong muscles and are extremely efficient at stripping body fat and getting you a lean, feminine physique quickly,” Libin says. Kettlebells (which look like a cast-iron cannonball with a handle) are particularly good at sculpting a slim waistline because the odd shape causes the weight to be distributed unevenly. “Your core muscles are continuously engaged throughout every motion to control the bell’s shifting center of gravity,” explains Libin. In fact, a study commissioned by the American Council on Exercise found that eight weeks of training with kettlebells increased study participants’ core strength by 70 percent. Libin’s Kettlebell Kickboxing program has transformed the bodies and abs of thousands of clients—including her own. After hitting a plateau with her martial arts and weight lifting training in her 20s, Libin decided she needed to devise a plan that would allow her to shorten her workouts (at that point she was working out for up to two hours a day) while increasing her results. Her inspiration to try kettlebells came from her grandfather, who taught kettlebell training to the Soviet Army in Russia. “It only took three weeks of training with kettlebells for me to see distinct abdominal definition, and I cut the amount of time I was exercising in half,” Libin says. “While I thought I had decent abs before, this was a whole new level—the results were shocking.” Not only did Libin see improvements in her ab aesthetic, she was also able to run faster, kick higher, punch harder, and her knee pain disappeared. “I realized that I didn’t have to do two different workouts to get in my cardio and strength training—by combining traditional kettlebell exercises with martial arts motions, I was able to get it all done at once,” she says. 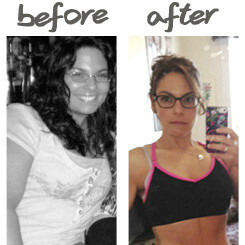 Ready to see what Kettlebell Kickboxing can do to your body? Try this workout from Libin, which includes her favorite core moves from her new Kettlebell Kickboxing KB Body DVD Series (available at kettlebellkickboxing.com). What weight to choose: Start with a weight that’s challenging, such as 15 pounds. “You’re distributing that weight along many muscles, not isolating one muscle group, so don’t be afraid to go heavy,” says Libin. Stand with feet hip-width apart, arms hanging next to body, kettlebell in right hand, gripping the kettlebell overhanded with palm facing towards body. Keeping abs tight, bring right arm around and in front of the body, passing kettlebell to left hand in front of hips then continue in a circular motion brining left hand around and back, passing to right hand behind body. Every time the kettlebell crosses in front of the belly, feel abs tighten. Continue moving it in a continuous circular motion at hip height for 30 seconds, then switch directions. Standing with feet together, hold kettlebell by horns (closest to the base of the bell on each side of the handle) at chest height. Keeping abs tight, slightly bend knees and hinge at hips, pulling kettlebell down and across body to left hip. Reverse move and return to standing, bringing kettlebell across body and over right shoulder, keeping elbows bent. Continue this chopping motion for one minute, then switch sides. Stand with feet hip-width apart, left foot facing forward, right foot facing towards the right. Extend left arm overhead, right arm hanging in front of the body holding the kettlebell, both palms facing away from body. This is your starting position. Keeping left leg as straight as possible without locking the knee, push hips out to left and lower torso to the right, allowing kettlebell to graze along right leg until it touches the floor (or you reached your full range of motion). Pause for one second, then reverse motion back to start. Keep gaze focused on left arm extended overhead throughout entire exercise. Continue for one minute, then switch sides. Lay on back with arms and legs extended on the floor at a diagonal, creating an X with the body, palms facing the ceiling. Simultaneously lift upper back, arms, and legs up a few inches off floor, while pressing mid-back down and keeping abs tight. Hold for 5-10 seconds then release. Repeat for one minute. Hold kettlebell by horns (closest to the base of the bell on each side of the handle) and keep it at chest height throughout the exercise. Start lying on back with knees bent, feet flat on floor. Using ab strength, slowly roll up into a sit-up, trying to keep legs still. Bend right knee and tuck right leg under left, rolling onto right shin into a half-kneeling position on right leg with left foot flat on floor and knee bent. Keep abs tight and slowly reverse the move, coming back to the top of a sit-up position and then lowering back down to floor. Continue for one minute alternating legs. Modification: start without kettlebells and use hands to assist into kneeling position.